You know I’m a fan of making your own pasta sauce. For years, I've preached encouraged home cooks to step away from the jar. I even posted this terrific recipe from Marcella Hazen that I use all the time. However, life has a funny way of making us change our minds. In September, I started working as a reading paraprofessional at a local middle school. I love helping kids improve their reading levels before they head on to high school, but spending all day at school and then a few hours each evening and weekends writing doesn’t leave much time for making and freezing pasta sauce. 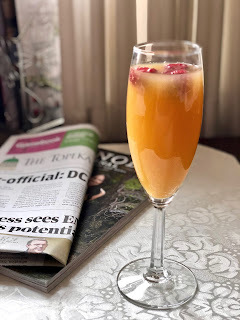 Most of my cooking time is filled with developing recipes for articles and this blog. I caved and went back to using the jarred sauce. 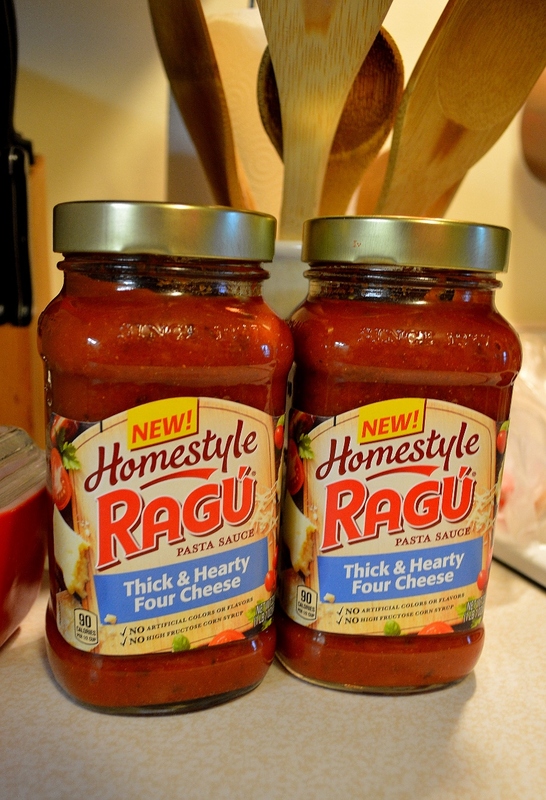 Then the Ragu folks offered to send me a couple of jars of their Homestyle Four Cheese sauce to try for National Spaghetti Day (today! ), and I couldn’t resist. 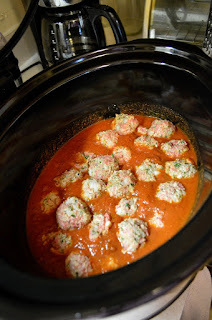 The sauce was the perfect excuse to test out this Slow Cooker Meatballs recipe, which I first saw on the Kitchn website. 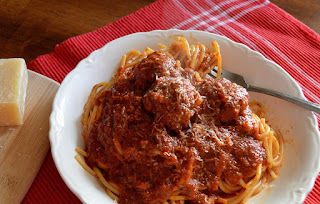 The original recipe makes its own sauce, but I decided to use the Ragu to make it even easier. 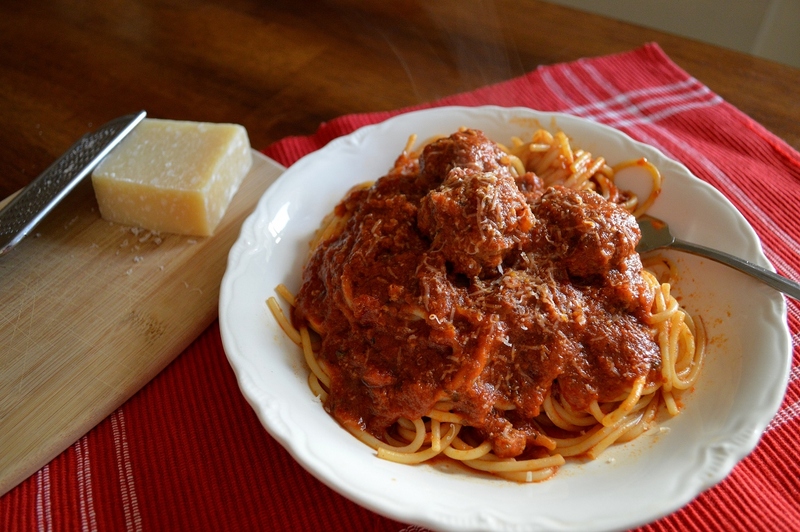 The meatballs can be made the night before and kept in the refrigerator. What really intrigued me about the recipe was I didn’t have to fry or bake the meatballs first! I just added them to the sauce. So easy! The meatballs were tender and flavorful. A couple broke apart into the sauce while it cooked, but that just made it more of a meat sauce. And while the Ragu sauce tastes great on its own, the simmering meatballs added a rich, savory flavor to the sauce. I enjoyed the meatballs and sauce on spaghetti last night. Today I plan to make a meatball sub sandwich. I’ll also freeze some of the leftovers for a busy weeknight meal. Pour the milk into a measuring cup, and then stir in the bread crumbs. Set aside. In a large bowl, whisk together the egg, salt, cheese and parsley. Add the ground beef, diced onion and minced garlic. Using your hands, mix everything together but try not to overwork the mixture. Using a tablespoon-sized scoop, (or you can just pinch off the amount you need) scoop out 24 meatballs onto a waxed paper-lined baking sheet. Roll each mound into balls. 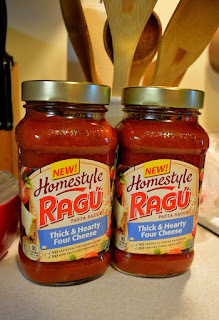 Disclaimer: The Ragu Company graciously sent me two jars of their sauce, but they did not pay me to make this post. All the opinions expressed are my own.